One of the important factors, often overlooked, when acquiring X-rays, is the critical role played by the person who operates the machine. In South Africa and the UK these skilled operators are known as radiographers (in the USA they are called radiologic technologists). Some radiographers choose to specialize in mammography and have to study further to earn the necessary certification. 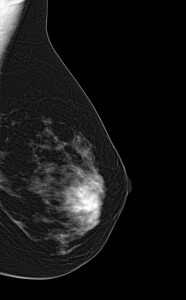 Aside from their technical skills, mammographers must also show empathy for their patients since having a mammogram can be a stressful experience. A clinical trial of our PantoScanner Soteria system was completed at Groote Schuur Hospital earlier this week. Thirty women who attended the breast clinic’s screening programme at the hospital were invited to participate in a trial evaluating the efficacy of Soteria. They were thus required to have a second set of images taken as part of a protocol that had been approved by the Human Research Ethics Committee of the University of Cape Town. 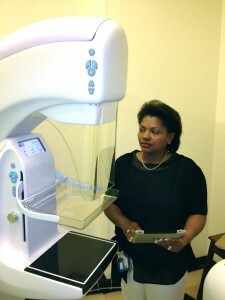 CapeRay was fortunate to recruit an experienced mammographer, Norah Mabota, to acquire all the images. Norah has worked for over 20 years as a radiographer and recently served as head of mammography for two private practices here in Cape Town. She has a bachelor’s degree in radiography from the Cape Peninsula University of Technology, and has twice attended courses on the detection and diagnosis of breast cancer taught by László Tabár. We were interested to find out what Norah’s experience was when using the iPad to control Soteria and how it compared with other systems. She responded, “Touch screen technology is easy to use and makes window levelling and magnification features fast and simple. Scrolling through the images back-to-back instead of the singular drag-and-drop method of other systems saves time”. In fact, image acquisition time was one of the parameters recorded, with Norah stating that, “When patients understood that the time spent in the mammography room was two-thirds less because Soteria operates faster, they were considerably less anxious”. Norah was also impressed with the wireless foot pedals, finding them light and easy to operate, freeing up her hands to position the patient’s breast on the platform. She observed, “Wireless pedals also eliminate the danger of patients and staff tripping over cables”. The next step will be for two experienced radiologists to compare Soteria’s images with those of the hospital’s system and declare them diagnostically equivalent. Watch this space for details! Well done! Once declared “substantially equivalent” this will be a major step forward in achieving compliance.